Watch out for pucks! 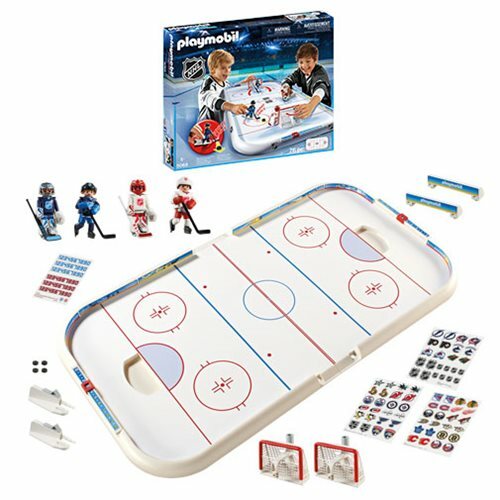 The NHL Hockey Arena includes 4 figures, 3 sheets of team stickers, 4 picks, 2 goals, 4 sticks, and everything you need for a small game of hockey on your desk. Additional figures sold separately. NHL, the NHL Shield, and the word mark and image of the Stanley Cup are registered trademarks of the National Hockey League. All NHL logos and marks and NHL team logos and marks depicted herein are the property of the NHL and the respective teams and may not be reproduced without the prior written consent of NHL Enterprises, L.P. ©NHL 2017. All Rights Reserved. Ages 5 and up.